When Lydia was still just a baby, a friend asked me if I was going to “get all into sensory tables” like her sister was. I’d never heard of a sensory table, but I thought it sounded dumb. Doesn’t the world around us provide enough sensory stimulation on its own? Why would we need to try to maximize it? I told her, Probably not. Fast forward a year and a half, and the sensory table is one of my best friends. We use ours almost every day. 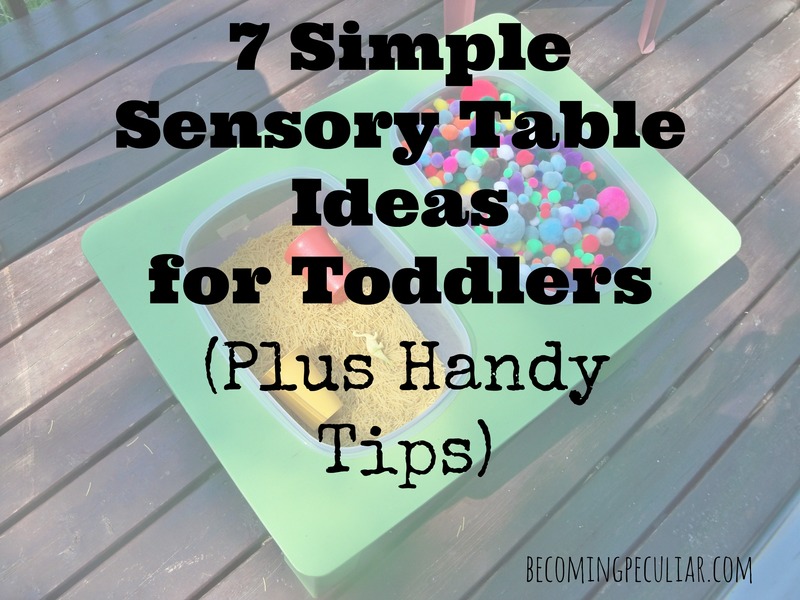 What is a sensory table, you ask? That’s just a fancy name for a low table that can hold one or two containers with different materials for little people to explore. Sand and water are common, but the possibilities are endless. Sensory “tubs” are also common — which just means you set the tub on the floor or another surface. You don’t actually need a table. 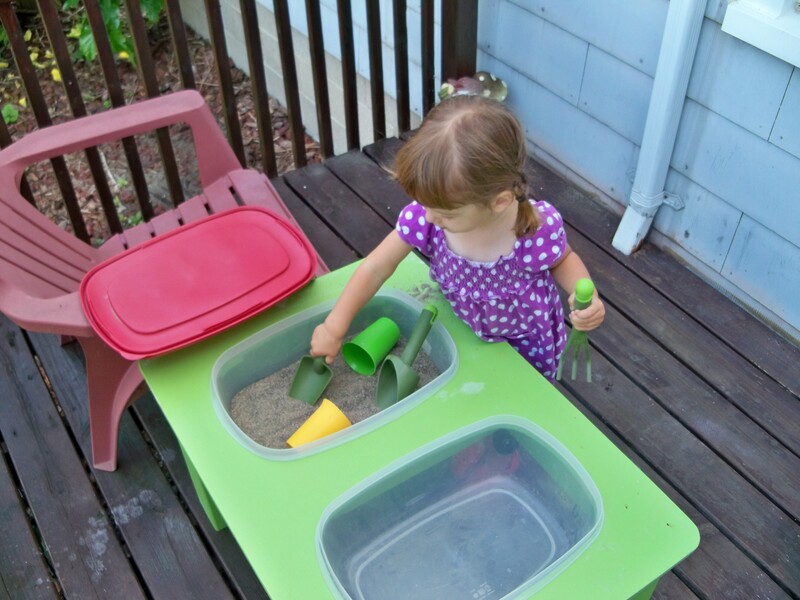 A table is just nice so your child can stand while she plays, without the risk of the tub falling. 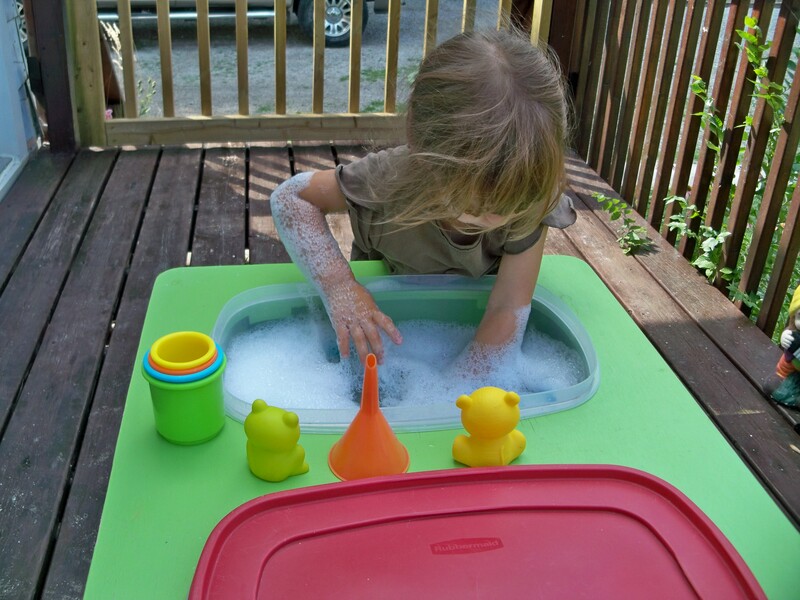 The sensory table is not just about stimulating the senses, though it does that, too. It’s a great place to learn. 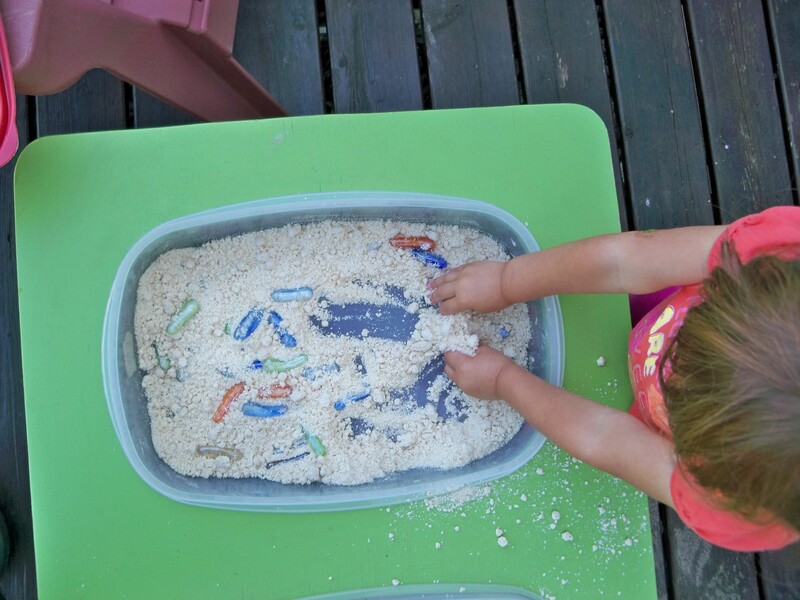 You just throw some different types of scoops, cups, and toys along with the main material, and you’ve got a source of unlimited learning opportunities. It’s a great place for young kids to exercise their fine motor skills, to explore different media, and to learn about things like cause and effect. Without adults having to offer any kind of instruction, toddlers can practice important skills like pouring and transferring. They can learn how solid materials (like sand) act different from liquids, or how mixing the two creates something completely new. These are all learning experiences that are more appropriate for little brains than anything they could learn from a screen. And the absolute best part? 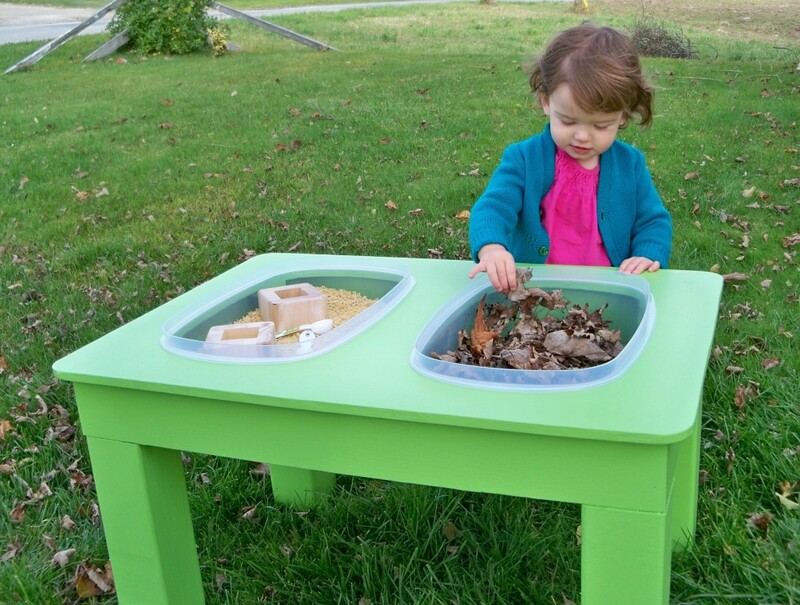 The sensory table can keep your toddler out of your hair for precious minutes of your day, so you can get stuff done. Without having to resort to television. My husband made our sensory table out of scrap wood, based off a few designs we saw online. He essentially made a low, sturdy table, with two holes cut into the top to hold the containers. Some sensory tables just have a sort of railing to hold the container in place. We decided to go with a design that could hold two containers (with lids). I’ve since learned that one container would have been enough — we rarely use more than one at a time. But two is nice, too — I usually just leave one container empty, and Lydia can transfer materials from the full one to the empty one. Two containers might be handy if you have more than one child, too, so each can play in his/her own container. 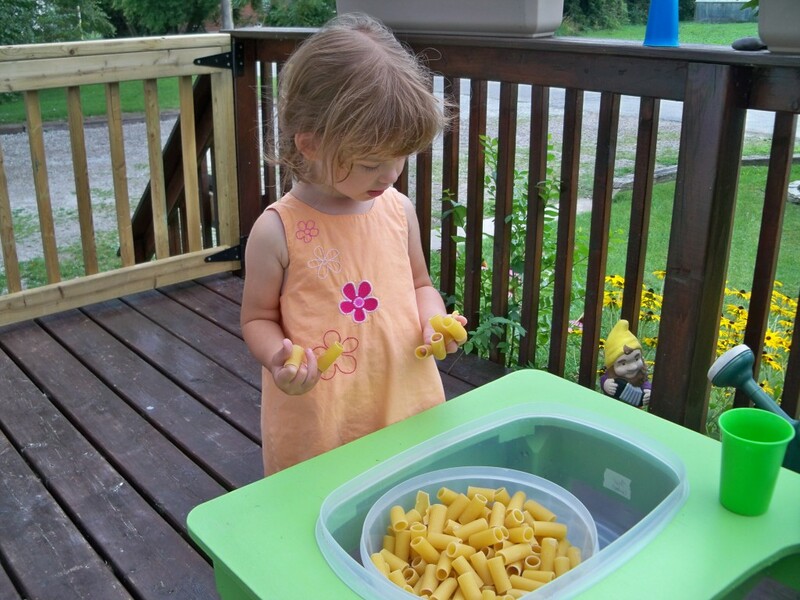 We made our sensory table when Lydia was about a year and a half, but she didn’t really start using it properly or enjoying it until she was closer to two. 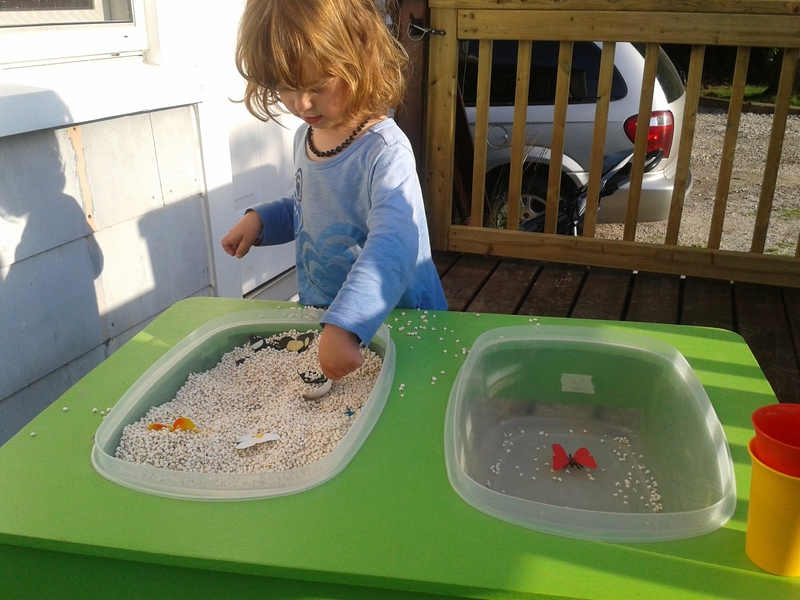 For us, the sensory table is better as an outdoor toy. We never really succeeded in teaching her not to throw everything on the floor. That might have been my fault — I always wanted to use her sensory table time to do my own thing, and failed to stick around to teach her how to use it properly. So it didn’t get much use during the winter — it was too messy. As soon as the warmer weather hit, though, we were able to take it outside onto our front porch. Now it gets used almost every day. At the end of each session, I just sweep the mess off the deck and down into the cracks. 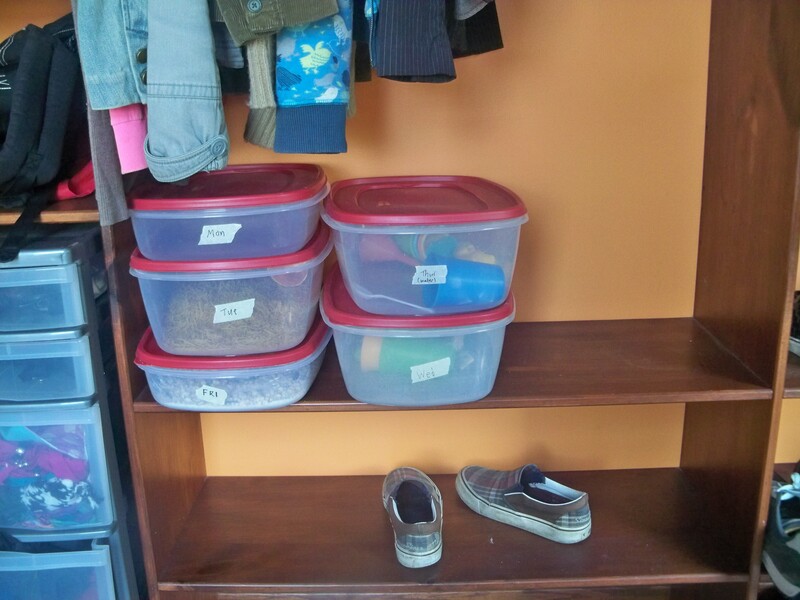 Buy several bins with lids, and then keep the materials in them permanently (except water). We found that the best way for us to get maximum use of our sensory table was to buy five bins — one for every day of the week (minus the weekend) — and then label them with the days of the week. On Monday, I pull out the Monday bin, and so on. This way, they all get used equally, and she never gets bored of a single material. Include toys with the materials. At first, I would just give Lydia a bin full of beans or leaves, thinking that that would be enough, but she got bored of these quickly. After I started to keep toys and scoops in the bins, she became much more interested in them, and could play with them for a lot longer. Cups, spoon, and little shovels are great, as well little toys to hide. Here are some of Lydia’s favourites! Most of the combinations are random, and are just meant to offer inspiration. Like I said: the possibilities are endless. 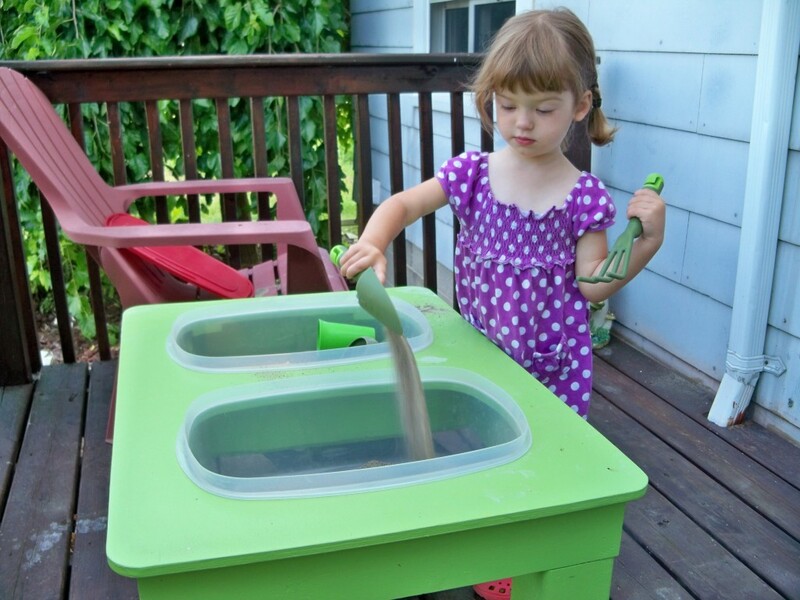 Experiment, mix & match, and change out the materials as your child loses interest. 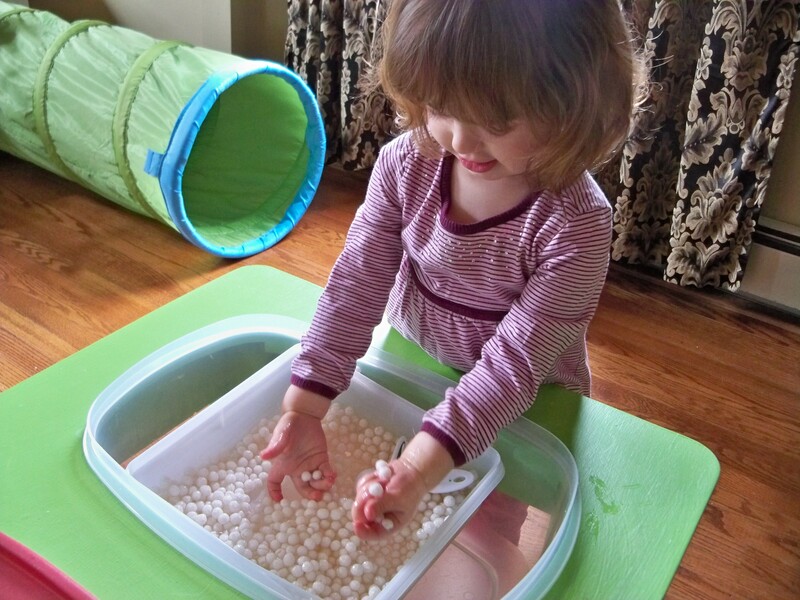 Have you tried sensory bins? What did you put in them? 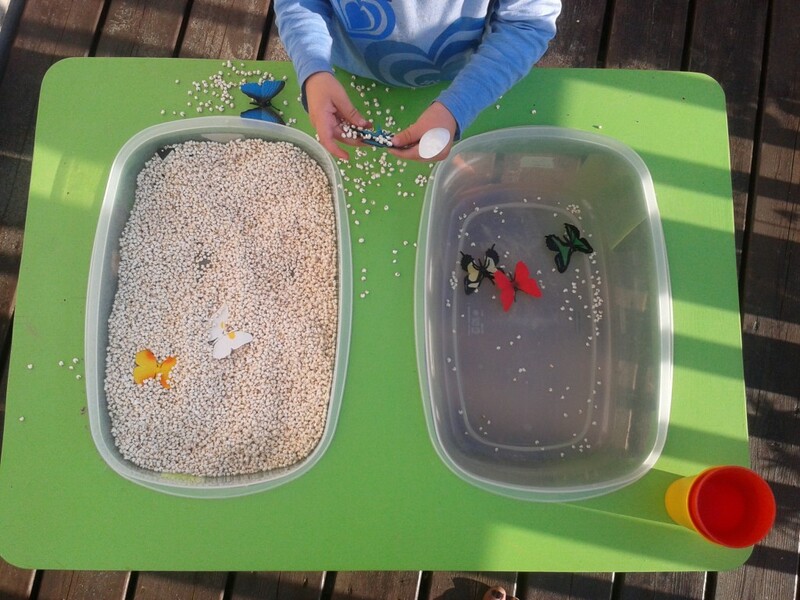 What are your child’s favourite sensory materials? I love the table! We spread a sheet over the floor and set up kids with the tubs right on top of them. Having everything right at their level is such a great idea though, not to mention easier to clean up. Our son loves dyed dry rice. The table looks great! Seems like a natural progression from my wee girl’s much loved heuristic play basket. 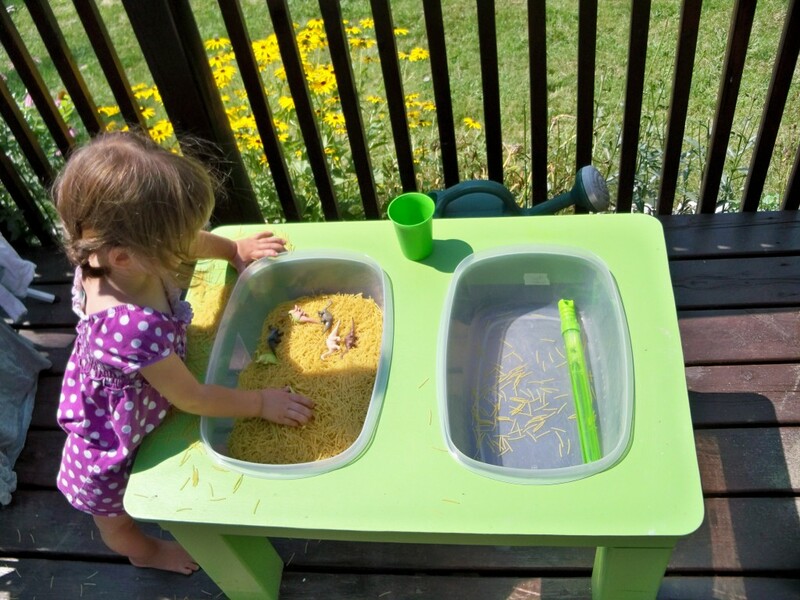 Spring has arrived here so I may have to convince hubby to make a table, we have borrowed a plastic water-play table from the toy library a couple of times – but wood is much nicer/prettier! I think you’ve just convinced me to get/make one! “Washing Trains” is a favorite in our house. 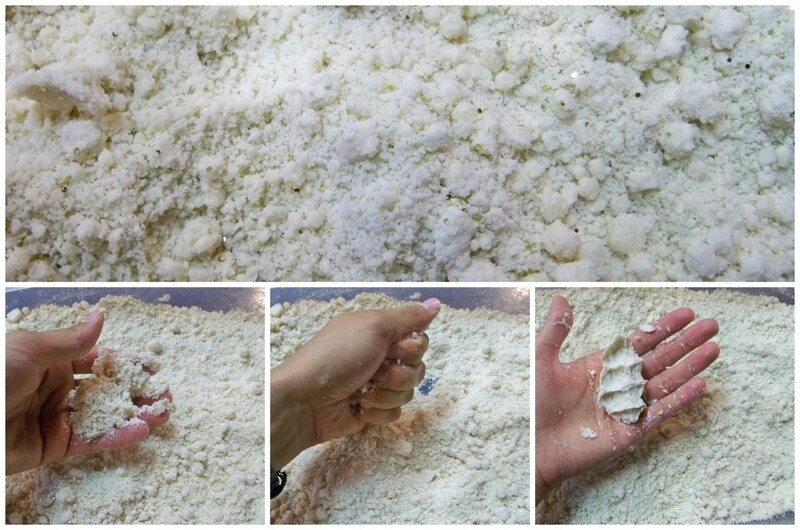 If you want a messier game, that’s still fun, break out the cornstarch, water and food coloring and make goop! Molly recently posted..Happy Birthday Tomie De Paola! What a fantastic table! We just use a plastic bin on a towel on the floor. I like the idea of adding small toys to burry and find. I’ve included scoops and cups, but not regular toys. I’ll have to try that next time. How tall is your table? I’d like to make one for my DS to help him start standing and then use for sensory when he’s a bit older. Hi Jenny! The table top stands at about 20″, and it’s the perfect height for a toddler — at first to stand; then to sit with a little chair. Hey! Could you tell me the dimensions of the table and the particular brand of bins you use? Im going to have my husband build one (or two) for my in-home day care. 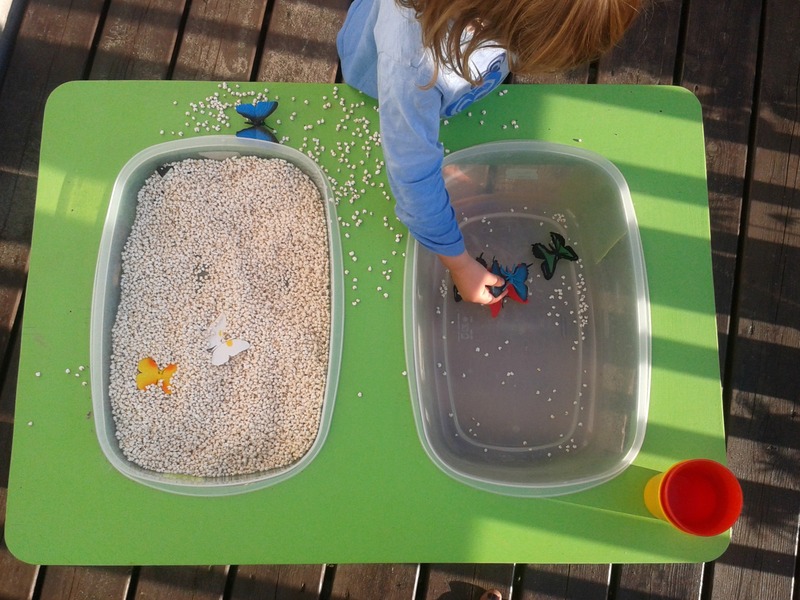 I’ve been using a regular sand/water table- but its so difficult to remove and change the materials on a consistent basis. Sure, Stephanie! I use Rubbermaid Easy Find Lids containers (1.5 gal and 2.5 gal. They’re they same size but different depths, to accommodate different materials. Sometimes I want shallow. sometimes deep). The dimensions of the table are 32×21″, 17″ tall. Hope it works out for you! How do you keep your daughter from simply taking the tubs out of the table? I just built a sensory table for my son and the first thing he did was take all the tubs out. Now I have to come up w/ a detail to secure the tubs so they stay put while he’s playing but still allow me to switch out the tub when I want to.